Before a butterfly caterpillar transforms into a butterfly, he will become a pupa, also known as a chrysalis. A moth pupa, meanwhile, is a cocoon. Far from being a dormant stage, the pupal stage is a dynamic time, as the body of the caterpillar breaks down and reassembles itself as the adult insect. All you'll see, though is just a nearly motionless pod, which won’t need feeding but does require some attention if you're raising butterflies. The pupal habitat requires enough space for the insect to fully spread his wings when he emerges. Nearly all the butterflies you’re likely to keep pupate in elevated positions, often on vegetation, such as attached to leaves of the plant they were feeding on. Ideally, you should leave the chrysalis where it is. But in your captive care, this might not be possible. 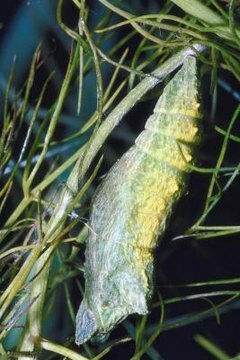 If the host plant starts to wither, dislodge the pupa, taking great care not to damage it. It will normally be hanging from the tip. Remove it with a little of the plant still attached. Attach the tip of the chrysalis to a scrap of paper with a minute dab of insect-safe glue. Attach the paper scrap to card stock, corkboard or soft wood. Strive to hang it in the same position as it was originally. Some butterflies emerge within a few weeks; others spend months in their pupal state. Check when your species is due to emerge and its temperature requirements. These indicate the best place to keep the chrysalis. For example, if the species is native to your area and spends the winter as a pupa, keep the tank or box somewhere sheltered but not heated. A garden shed or garage, provided no car fumes will reach the chrysalis, works well. Tropical species, on the other hand, may need to be kept in the warmest room you have. A chrysalis doesn’t need much in the way of care, but you should keep an eye on it. Check the habitat once or twice a week. Mist the soil lightly if it is drying out; remove anything moldy. Once the butterfly or moth is due to emerge, check the tank daily, looking closely at the chrysalis if it is aboveground. When the insect is about to emerge, the chrysalis usually changes color, and you might even see movement within it. Humidity is crucial when the butterfly emerges, so mist the air and/or soil with a plant mister. Use distilled or bottled water, not water straight from the tap. Tap water contains chlorine or chloramine, which is safe for you but not for insects. Don’t spray water directly onto the chrysalis, just keep the surroundings humid. Once the butterfly starts working his way out, watch but don’t touch. His body will be incredibly soft and delicate at this time. Once his wings have spread and hardened, which could take all day, and he’s moving around, you can transfer him to a butterfly house. Release him if he belongs to a non-pest species native to your area. Where Does a Peacock Swallowtail Butterfly Live? Where Do Galapagos Butterflies Live? Can You Do Anything to Help a Butterfly's Broken Wing? How Many Days Does a Butterfly Stay in Its Cocoon? What Kind of Butterfly Comes Out of a Green Cocoon?